Way back in 1997, (seems like a lifetime ago) I was the Sales Manager for the 5th Largest computer reseller in the country and we were growing rapidly. We needed a good inventory program to track all the hardware and software we were selling. Well there was not one available that did what we needed to do so I learned how to create and program databases – specifically DB 3 and Filemaker Pro. That was a lot of fun! (NOT). Anyway in 3 months I had all our inventory, sales invoices and accounts payable & receivables all working in our new database. The company gave me a bonus $5000 which was great even though I was not expecting anything – of course I took it. Then we needed a website. We tried several companies but again they could not deliver what we wanted. So I started learning how to build a web site and 3 months later we had the site we needed. I realized that I enjoyed creating web sites and when new owners bought the company, I was interviewed by the CEO of the company purchasing the company I was working for. Actually we had a four hour Sunday Brunch at the Harbour Castle Hilton. We exchanged views and philosophies on business and life and I soon realized he believed that there were two opinions to everything – his and the wrong one. At the end of the meeting, he said that they would be drawing up a new contract for me. I replied “Because I don’t like you”, and I walked away. Ever since then I have been in Web Development and Search Engine Optimization and I love it. So do the people working with me. JSI Webtools has been awarded by Web Hosting Search for its Excellency in Web Design. 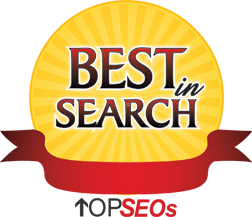 JSI Webtoolshas been awarded by Top SEOs for its proficiency in Search Engine Optimization.